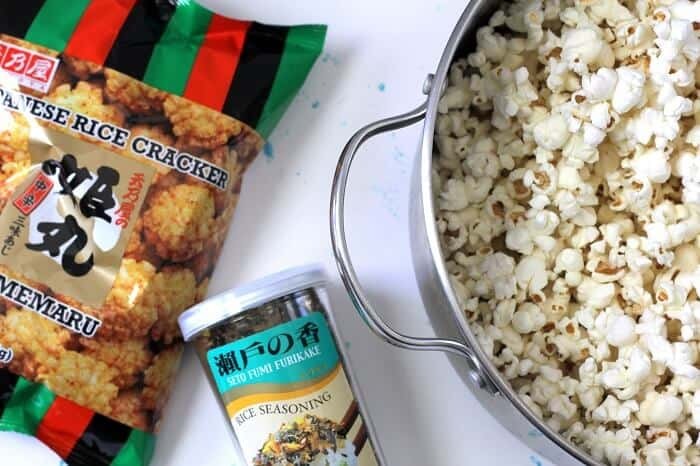 hurricane popcorn is a hawaiian popcorn snack, full of crunchy arare (japanese rice crackers) and furikake (japanese seaweed seasoning). 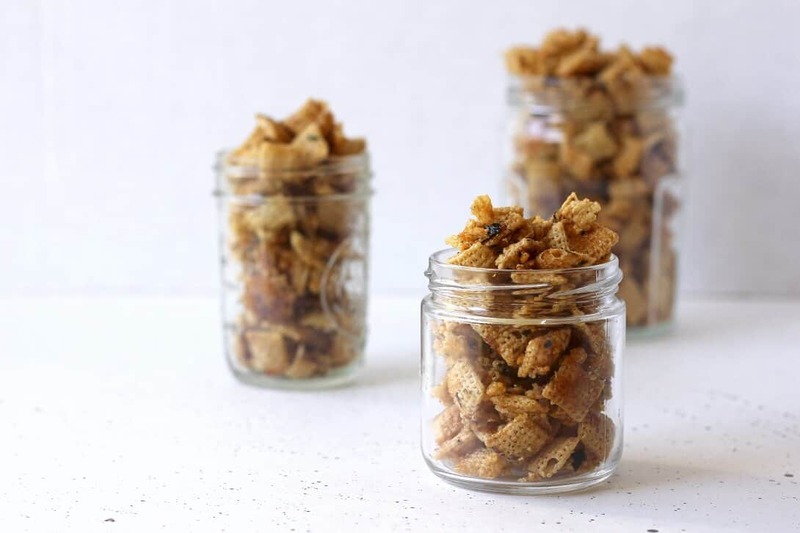 it’s crunchy and crispy and buttery and nutty and so addictive that you could polish off a batch by yourself! i’m normally not a movie person; i tend towards youtube videos (hi, dance videos) like the millennial i am. given the pair of 10 hour flights that dotted my last few weeks though, i’ve somehow squeezed a solid handful into my brain. some, like thor: ragnarok and the maze runner: death cure, were entirely forgettable, and others like love, simon were ridiculously good. and in case you haven’t heard my spiel yet: go see love, simon. especially if you like a side of tears and heart mush with your movies. i had croissants and whippy ice cream and ginger ale while i was watching these things, which i was perfectly happy with. but i feel like some people have strong feelings about movie theater popcorn. sure, it’s buttery and salty and crunchy, but my ideal popcorn involves less fake butter flavors, less salt (let’s not dehydrate our tongues before the movie even starts, which then inevitably leads to chugging water which leads to emergency bathroom breaks during pivotal points of the movie) and less probability of soggy popcorn/more crunch. so if i have to have popcorn while watching a movie, i vote for hurricane popcorn. hurricane popcorn, you ask? 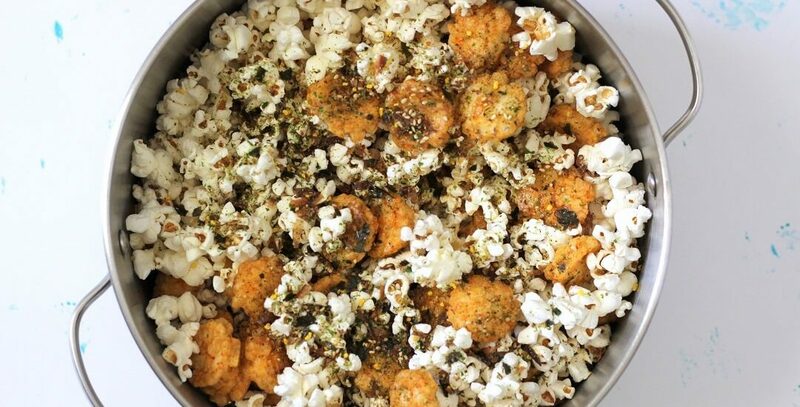 it’s a hawaiian and japanese inspired popcorn idea, with plenty of crunchy arare, or japanese seasoned rice crackers, and furikake, a japanese rice condiment with shredded seaweed and sesame seeds. there’s furikakes with salted plum and salmon and all sorts of things- this one has egg yolk, but i usually go for ones with bonito, or dried fish flakes (i’m not describing this well ack). these are the brands that i’ve used here; use them as a starting point if you don’t know what to even begin to look for. 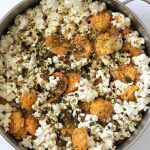 Hurricane popcorn, or seasoned popcorn with shredded seaweed bits and rice crackers, is the perfect savory popcorn to munch on when you're tired of the usual butter and salt. Pop the popcorn. I like using an air popper because you can set it and forget it. You can also use a (very) non-stick pot. Add the kernels, cover the pot and let them pop over medium heat until the popping subsides. 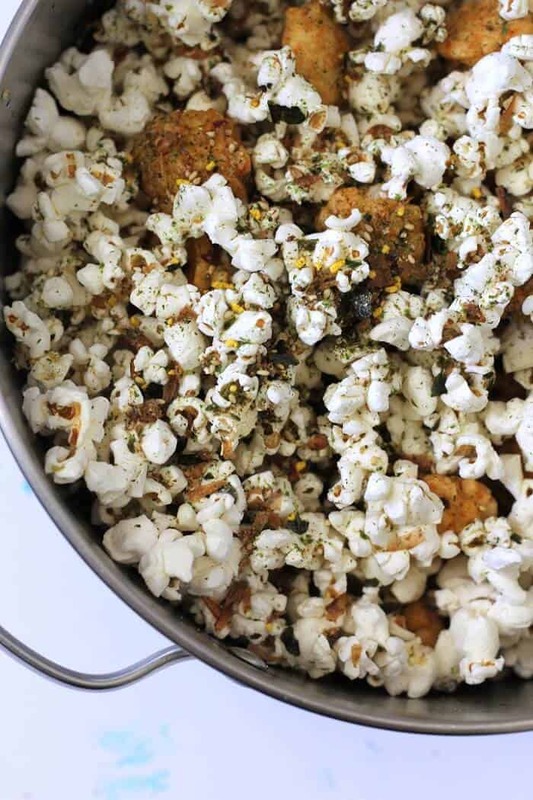 Add the arare to the popcorn, drizzle the butter on top and sprinkle the furikake and salt over everything. 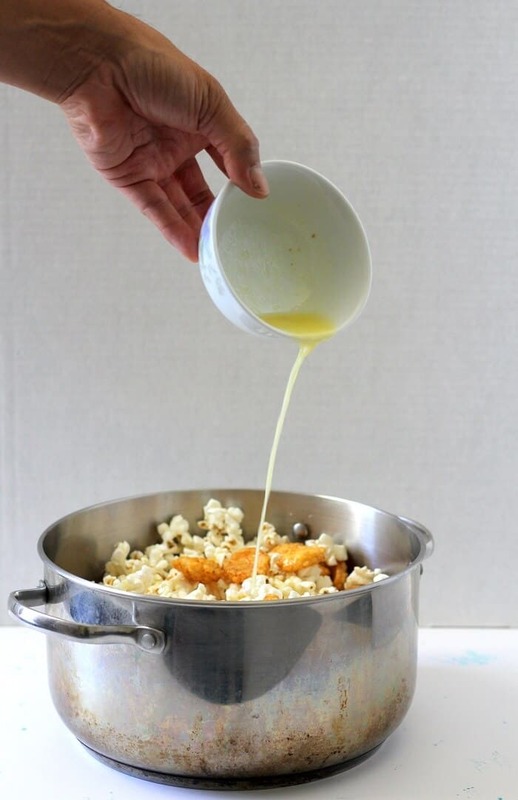 Cover the pot and shake until the popcorn and arare are well-coated. Serve immediately. 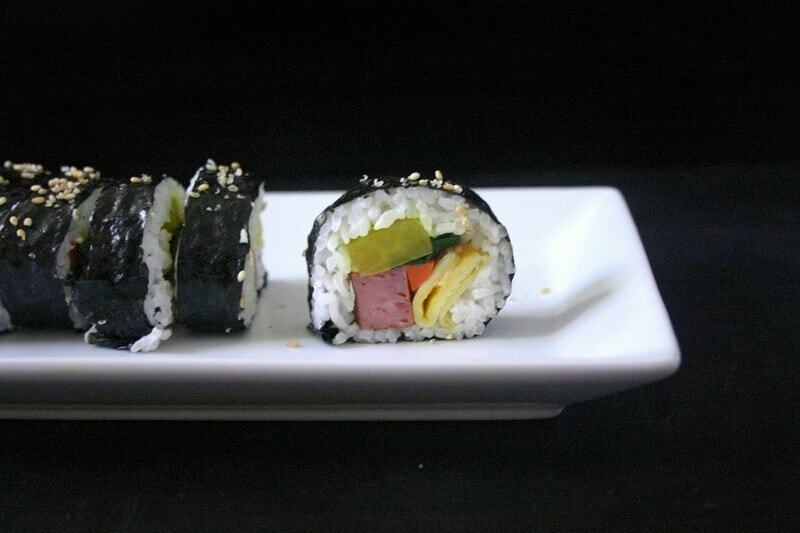 Serve this immediately. The popcorn and ararake start to get soggy pretty quickly. I don't recommend serving this more than a few hours after you mix it- you can try to re-toast it (ie in a low oven), but it's not the same as when you mix it right away. If your furikake isn’t salty, add more salt to compensate. That sounds so different and amazing!! YUM! Love the spin! OMG this looks so fun! I can’t wait to try this! all the fun (; thanks mimi! Heather – I’m totally with you about the movies – I’ve seen 2 of the 3 “forgetables”, which I forgot I had seen and also “Love, Simon” which I indeed absolutely loved! This popcorn, also looks like something I would absolutely love, and I’ve never even considered combining Japanese snack food with popcorn. Thanks, I think I’ll make it for my next movie night! YESSSS love simon (: some of my friends are like eh too lazy to watch so i’ll just have to bribe them w popcorn and make them watch! 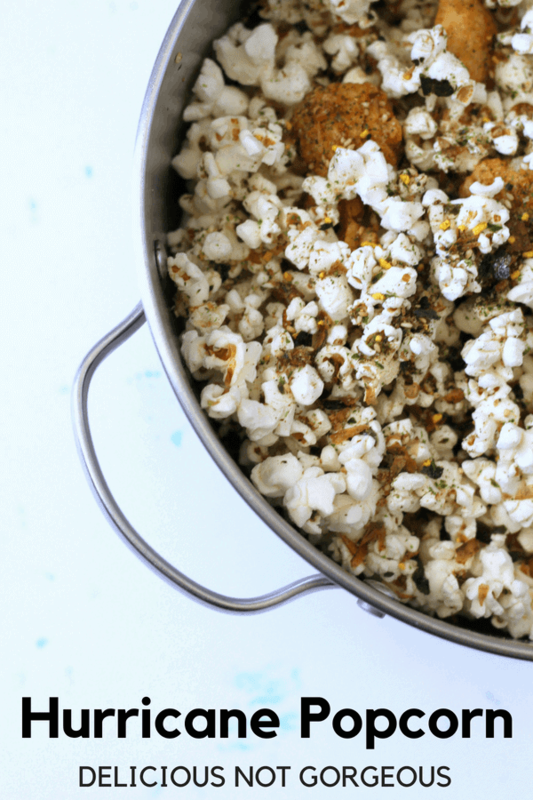 What a creative spin on popcorn!! I love the idea of the crunch from the crackers 🙂 This is definitely my idea of gourmet popcorn! Oh and 10-hour flights?!! The only way I can get through those is by watching movies too! I am making popcorn on Saturday and this sounds like a great version to serve. I would love this salty snack! Like all the time! And with a movie would find me eating the whole batch! I feel like I catch up on all the movies when I’m on long flights because I just can’t sleep when flying, but somehow I haven’t seen any of the movies you mentioned. I’ll put Love, Simon on the list to watch. Anyway, this popcorn looks like something I would love to snack on! This is not something I would ever have dreamed up on my own, but it sounds so awesome that now I definitely have to try it! The hurricane popcorn looks super cool (you’d make bank at 626 night market???) But seriously, you’re combining all of the good stuff and love that it is easy to make. Gotta try this out some day! Thanks for sharing, girlie! HAHA i think i’d also just be stressed out working night market since there’s so many people. Wow! this is something I’ve never seen before. I’m a popcorn lover but regular ones. Home made with salt. Sometimes that’s what I have for dinner when I’m lazy to cook (not sure if that’s a good dinner). But this is different for sure! haha yes i’ve had popcorn dinners before (; definitely not a great dinner but sometimes all you want is popcorn! Ooooh! I love this idea! sounds soo interesting! although I’m afraid I just won’t be able to stop eating it! It’s hard enough with plain popcorn!